E-Clips Gold is a 3G quad band dual and triple SIM adapter which allows to use 2 or 3 phone numbers active at the same time on your iPhone. This adapter is the only one in the world that turns your iPhone into a simultaneous Dual Triple SIM smartphone and allows to make data from any SIM card on one mobile phone. E-Clips Gold Triple dual SIM allows you to make and receive calls, surf the internet at high speed, send and receive SMS, all with two or three SIM cards simultaneously and without having to carry several mobile phones. You can manage your calls, messages and data on two or three phone numbers active simultaneously from the screen of your iPhone and centralize all data of your 3 SIMs (phone book, SMS, call logs ...) on one iPhone. The E-Clips Gold Dual Triple SIM device is also a Mi-Fi Wi-Fi 3G cellular Router. 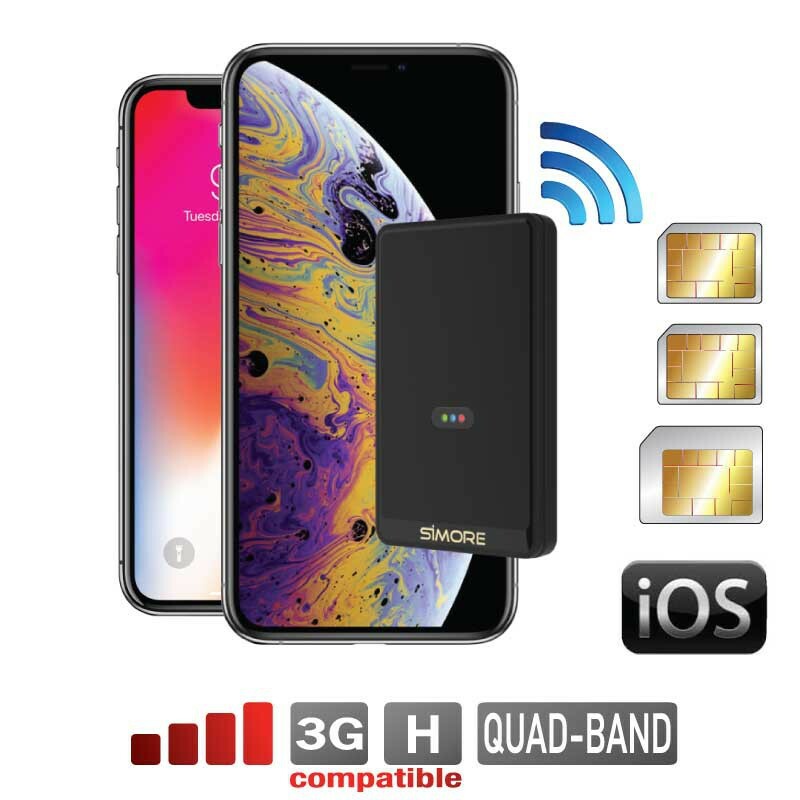 The Triple dual SIM E-Clips Gold creates a Wifi access point secured by a password and connects to your smartphone, allowing you to enjoy Internet connectivity wherever you are and at any time. It is possible to connect up to 8 users at the same time and provide them high speed internet access. Your family, friends or colleagues can use the wireless connection to browse Internet, download and watch images and videos, catch up with their social networks... simultaneously. With its stylish and functional design, the Triple Dualsim E-Clips Gold adapter is easy to carry and always stays with you. This innovative adapter has been specially designed to be used alone, as a compact box that fits into your pocket or your bag, or to be clipped on your iPhone with the E-Clips Case. The E-Clips Cases are for iPhone XS, iPhone X, iPhone 8, iPhone 8 Plus, iPhone 7 Plus, iPhone 7, iPhone 6 Plus, iPhone 6, iPhone 6S Plus and iPhone 6S (other cases will be available soon for other smartphones). Click on E-Clips Case to discover our cover case for iPhone 8, 7, 6 and 6S. Click on E-Clips Case Plus to discover our cover case for iPhone 8 Plus, 7 Plus, 6 Plus and 6S Plus. Click on E-Clips Case X to discover our cover case for iPhone X and XS. Download the SIMplus App from the App Store to install it on your iPhone. Insert 1 or 2 SIM cards into the E-Clips Gold device. Connect your iPhone to E-Clips Gold via Bluetooth (wireless connection). Enjoy the simultaneous Triple Dual SIM phone function. With its simple and intuitive interface, the SIMplus app allows you, at a glance, to select the right SIM card, access your contacts and messages, view your networks information, mobile phone provider, signal strength, the battery level and the Wi-Fi router status. E-Clips Triple dual SIM quad band has a micro SD card slot (up to 32 Go) which provides an external storage option. It is equipped with an anti-loss function that alerts you when the box is distanced from your iPhone and you can also quickly find its position with the integrated geo-localisation system. With the long lasting battery, the Dual Triple SIM E-Clips Gold can operate for 5 to 8 hours despite intensive use. It is rechargeable via the provided micro USB cable. Your iPhone becomes a Dual or Triple SIM card smartphone. Have high speed internet access with you everywhere. Wireless Multi SIM Wi-Fi Hotspot Router for up to 8 users. Connects to your iPhone via Bluetooth in a radius up to 10-15 meters. Cloud option to be informed of calls and SMS even if E-Clips Gold is disconnected. Anti-loss function with possibility of geolocalising the last position before deconnection. Bluetooth multi-point access to use other Bluetooth devices (hands-free headset, car kit…). Call forwarding option to redirect your incoming calls. VoIP function to call abroad from your iPhone via a VoIP provider. Micro SD card extension for external storage capacity (to be used as a USB flash drive accessible by cable). Box clippable on the E-Clips Cases. I want to have 4 or 5 SIM cards, or more, on one mobile phone. Is it possible ? Yes, you can mix one Bluetooth SIM adapter with one X-T 3G/4G adapter. Can I receive calls and SMS simultaneously on 3 SIM cards with the E-Clips triple SIM bluetooth adapter ? Yes, the bluetooth adapter E-Clips is a Triple SIM system with simultaneous connection that allow you to use 3 active SIM cards at the same time on one mobile phone. Can I surf the web and make data with E-Clips Triple SIM active adapter ? Yes, E-Clips allows you to make data and browse the internet through the SIM data plan of your choice (with the SIM placed into your mobile slot and with the SIM-1 placed into the adapter). How to share my Internet connection ? You can share your Internet connection with up to 8 users. Simply activate the Wifi tethering function in the SIMPlus App and connect to the E-Clips Multi-SIM Wifi Hotspot. Can I use all SIM cards sizes into the Triple Dual SIM E-Clips ? E-Clips hybrid SIM slot supports one Nano SIM card and one Micro SIM card. It is possible to turn your SIM cards into micro or nano SIM size by using our SIM accessories. Do I need to buy a case to use the E-Clips triple SIM adapter ? The case is optional. You can use E-Clips on it's own, just keep it in your pocket or your bag or fix it on the E-Clips Case for iPhone 8-7-6-6S, E-Clips Case for iPhone 8-7-6-6S Plus or E-Clips Case for iPhone X. So long as it is in Bluetooth range, it will work perfectly. What is the E-Clips battery life ? The E-Clips triple SIM active adapter has its own battery. E-Clips can last up to 20 days on standby. However it will last 18-24 hours 'talking time' (calls and SMS). When used for data it will last from 5-8 hours. Do I need to unsimlock or jailbreak my iDevice to use E-Clips triple dual SIM active bluetooth adapter ? No, you don't need to unsimlock or jailbreak your Apple device to make it work with E-Clips. What is the Bluetooth's and Wi-Fi operating range ? The Bluetooth and Wi-Fi connection range is 10 - 15 meters. How to charge the E-Clips adapter ? Each E-Clips adapter comes with a USB charging cable. You can charge it with your cellphone USB charger or with your computer USB plug using the provided cable. Can I use another Bluetooth device simultaneously with the E-Clips Triple SIM active adapter ? Yes, it is possible to connect at the same time another bluetooth system (for example Hands-free headset or car kit) to your mobile phone. Note: All available BT devices have not been tested. What is the difference between E-Clips and E-Clips Gold ? E-Clips is Dual Band (Band 1 and 8). E-Clips Gold is Quad Band (Band 1, 2, 5 and 8).